A gift card was given for review of the restaurant and for my honest opinion. No other compensation was given. If you have ever been to Red Lobster, you know that the star of their food (besides the amazing seafood) is their Cheddar Bay Biscuits! If you love them as much as I do, then you will be so excited to know that the beloved Cheddar Bay Biscuits are taking a home-cooked turn in Red Lobster's newest dish: the Cheddar Bay Biscuit Shrimp & Lobster Pot Pie! This delicious new entrée is on the menu through July 7 as part of the value-focused “Seaside Mix-and-Match” promotion, which allows guests to combine two entrées with soup or salad and unlimited Cheddar Bay Biscuits for only $12.99. With this promotion, you get to enjoy two exciting seaside dishes on one plate! Choose from dishes like the tasty NEW Cheddar Bay Biscuit® Shrimp & Lobster Pot Pie or the classic Garlic Shrimp Scampi. Plus, get salad and unlimited Cheddar Bay Biscuits®. Cheddar Bay Biscuit® Shrimp-&-Lobster Pot Pie: With peas and carrots in a creamy sauce, topped with a Cheddar Bay Biscuit®–our twist on a classic! Tropical BBQ Glaze Chicken: A jerk-grilled chicken breast with sweet papaya-BBQ sauce and fresh pineapple salsa. Also, just in time for Father's Day, check out another great limited time offer Red Lobster is offering! 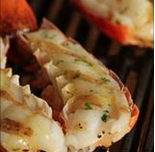 Through this Sunday, June 16, add a Maine Lobster Tail to any adult dinner entrée for just $7.99. You can print the coupon here or find the deal on Red Lobster's Facebook page. This is a GREAT way to get Dad an extra treat this Father's Day without breaking the budget! So make sure to head to Red Lobster SOON before these two great offers end!